Belle has been on her summer holidays now for ooh, I don’t know, about two years? It feels like it anyway. She had her last GCSE exam on the 19th of June and since then she’s been at home, mainly asleep, or at least during the hours that I’m awake. Either that or she’s watching TV or playing on her phone. Part of me knows that it’s been a tough year or so for her, and if she wants to lie about doing not much for a couple of months then it’s probably fine. The other part of me does try to get her to think of other things to do sometimes, and encourage her to perhaps even leave the house occasionally. 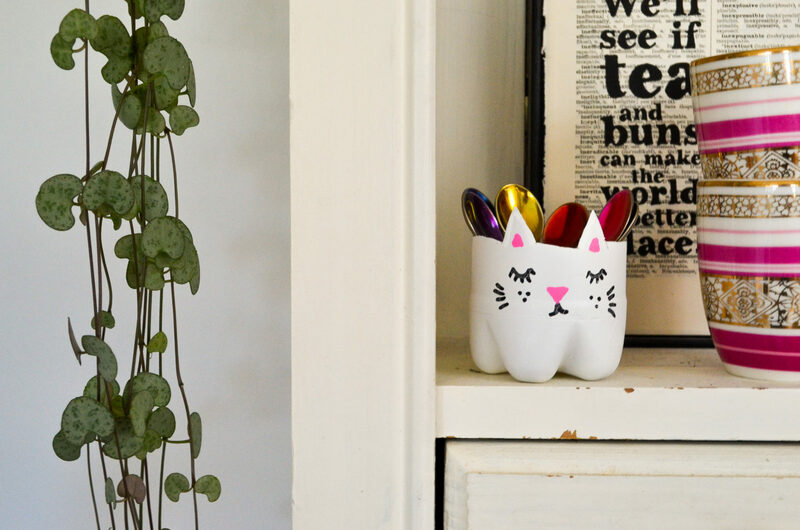 When she was younger Belle loved crafts, (remember the wall mounted make-up brush station we made out of old jam jars? ), and if you catch her in the right mood and call it a ‘life hack’ she’s still quite keen. The last year of school has definitely been a drain on her emotionally and I wanted to come up with some activities that might kick-start her creativity. As the second part of our project with Coca-Cola Great Britain, which is all about keeping plastic off the streets and out of the oceans by making recycling creative and fun for families, I thought I’d get Belle to have a go at some plastic bottle upcycling activities. We recently took part in a beach clean, which was meant to get us both thinking more about the consequences of not taking care of our waste, so this challenge was about putting those empty bottles to better use. Coca-Cola is always looking for new ways to encourage people to recycle more plastic bottles, but that doesn’t necessarily have to mean just bunging them in your recycling boxes – it could be turning them into something new at home. 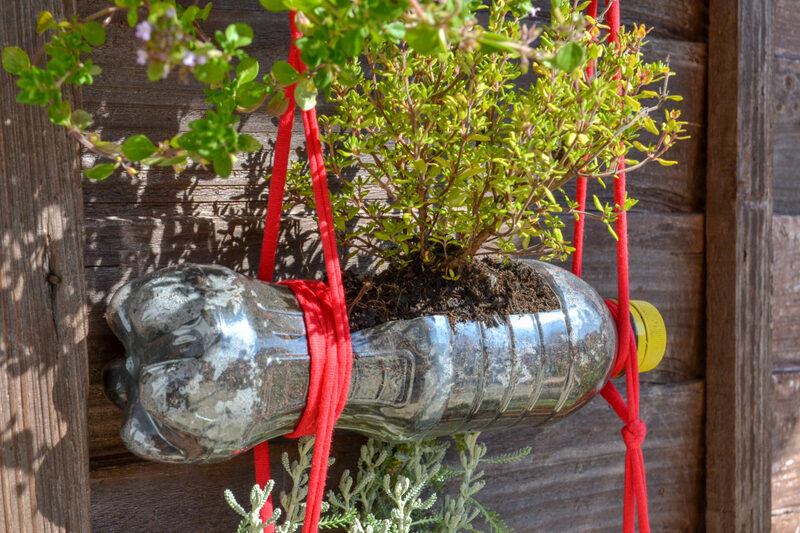 When you re-purpose your old plastic bottles you can do your bit for the planet and have a bit of cheap family fun at the same time. Winner winner chicken dinner. 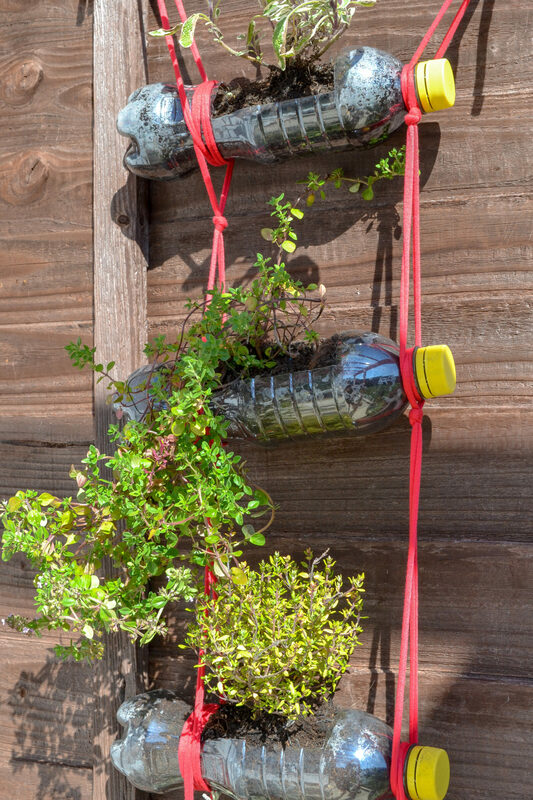 We did some research online and had a go at four cool plastic bottle upcycling ideas – four fun ways to use your empty plastic bottles that are particularly suited to teenagers. (Belle made all of these projects herself.) Hopefully this will give you the inspiration you need to think about those empty plastic bottles in a new way, and have some fun together over the summer as a family. You may not have picked it up from the hundreds of posts on my social media accounts about my cats, but I have a bit of a soft spot for kitties. When I saw some pictures online of plastic bottles that had been turned into cute little cat tubs, well, it was meant to be. 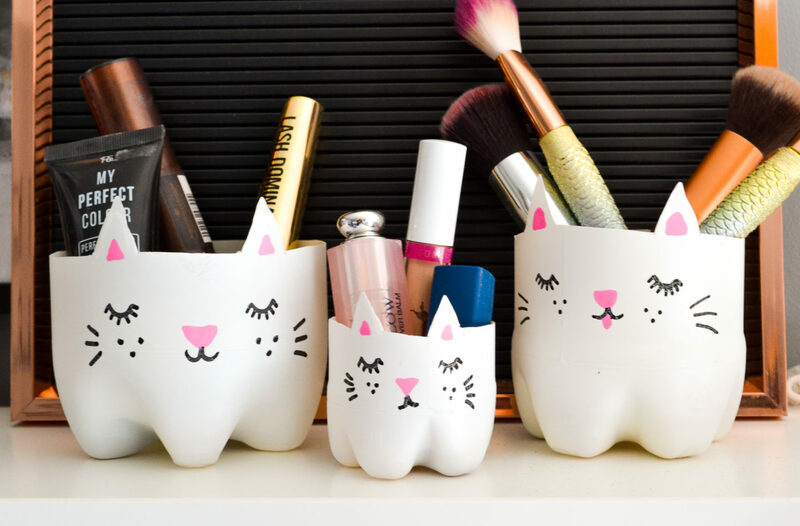 These are really simple to make, and if you use a selection of different sized bottles you can create a whole cat family! Simply cut off the end of the bottle, shaping ears depending on which animal you want to make, (bunnies work well too), and then spray your bottle ends white. (You’re best to do this bit outside.) When the paint has dried, draw on your faces with marker pens. These would also make great pots for mini plants or succulents. My other obsession is plants. Should you happen to swipe past me on a certain dating app in fact, you’ll see the first line of my bio is ‘Writer with too many cats and houseplants.’ It’s got worse since I bought my own house and actually have a garden of my own – I’m finally not limited to houseplants any more. My garden is small though, with only so much room in the borders, so what to do? The only way, obviously, is up. A great way to save space in a small garden at the same time as creating a striking display of plants is to make a vertical garden. You can use plastic bottles, as we have here, or tin cans and drink cans work well too. To make our hanging garden we cut a section out of the length of each bottle and punched a few holes in the bottom for drainage. Fill them with a selection of small plants – we chose some nice smelling herbs. You could hang them individually if you had a pergola or similar, or string them together to hang against a fence. We used two lengths of fabric and looped them around the ends of each bottle. Belle, like every other teenage girl in the world, cannot LIVE without lip balm. She has at least two on the go somewhere in the house at any given point. As quickly as she buys them though, she loses them. How cool is this then? 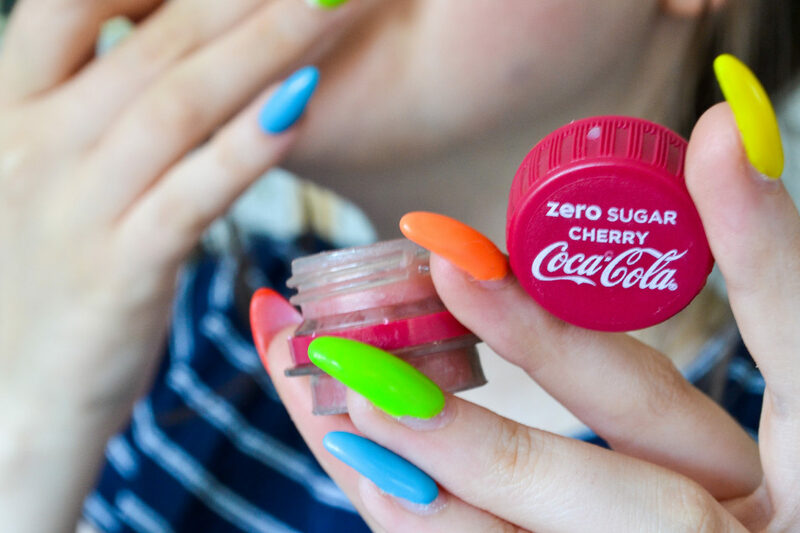 It’s lip balm in a Coca-Cola cap! To make your own, start by cutting off the top of a Coca-Cola bottle, very near the top. Super glue a circle of plastic onto the bottom as a base and leave to set. Fill your little pot with Vaseline, (or melt in a little bit of red food colouring if you want it tinted like Belle’s), and tah-da! 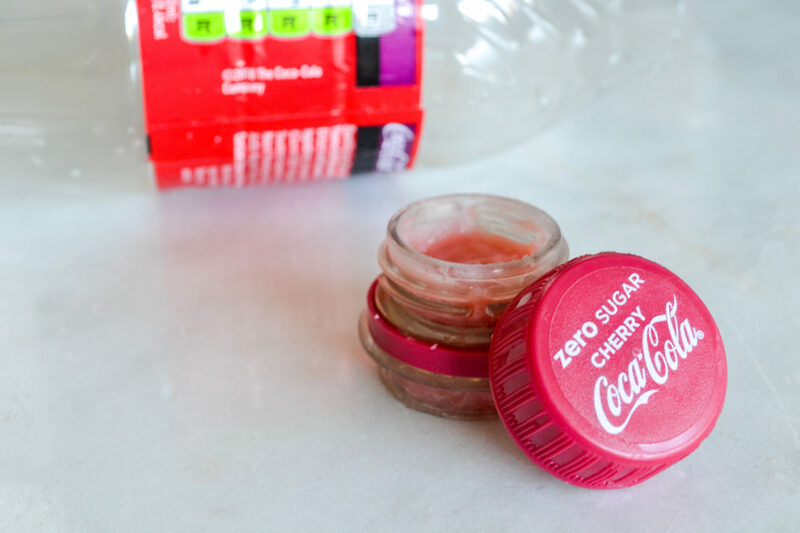 Your very own homemade Coca-Cola bottle cap lip balm. This last one is a plastic bottle recycling idea that I highly doubt you’re going to have tried before, but it’s going to go down VERY well with your teenagers. 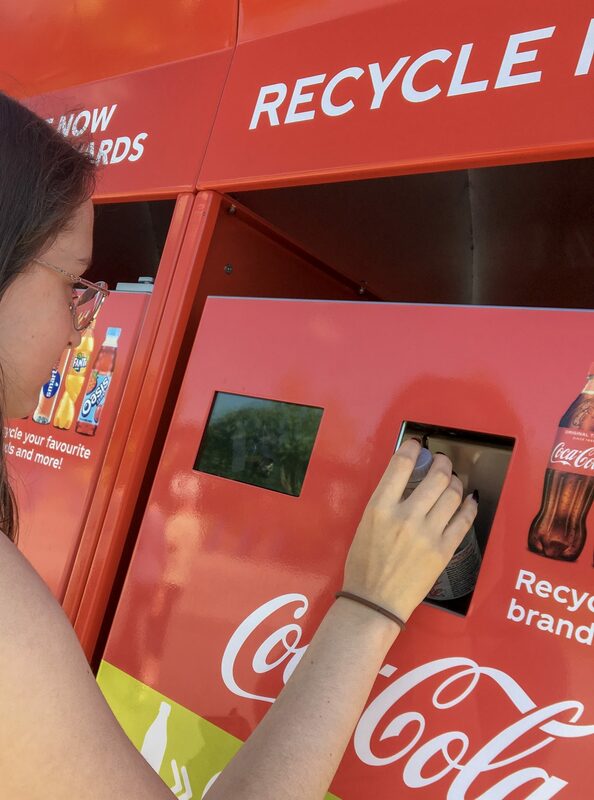 For the next few months Coca-Cola Great Britain [LINK TBC] is operating reverse vending machines across four of Merlin Entertainments’ top attractions – Alton Towers Resort, Thorpe Park, Chessington World of Adventures and LEGOLAND Windsor. You can exchange ANY empty 500ml plastic drinks bottle (not just Coke bottles) and instantly be rewarded with a voucher to receive 50% off the cost of entry at any of these four locations. The partnership is one of the first reverse vending machine trials in the UK offering an instantly redeemable reward – and one which is worth so much more than the item you’re depositing! – and is aligned to Coca-Cola broader sustainability packaging strategy, something I talked about in my last post. (See the end of the post for full T&Cs). Belle and I took a trip to Thorpe Park to put the reverse vending machines to the test. We’ve been to Thorpe Park a few times and when we go I always think about the time we went and I made Bee go on the train ride with Belle. Belle was so small, but looks the same as she does today. It’s so weird. 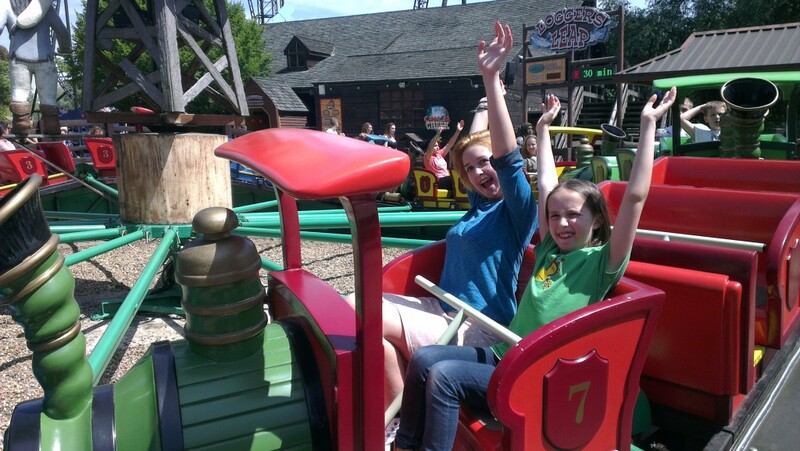 That must have been about seven years ago and to be honest I think even Belle was a bit big for the train ride, but they seemed to enjoy it. This time it was just me and Belle, and also Belle is taller than me. Gawd. Before buying our tickets we stopped at the project with Coca-Cola Great Britain to get our half price vouchers. They stand proudly in a big red row just next to the main ticket office outside the front gates – you can’t miss them. The machine accepts any 500ml bottle but as we’d had drinks on the way in the car, we had an empty Diet Coke bottle each to put into the machine. The reverse vending machine crushes your bottle and then as a reward, you get your coupon – half price entry to the park, such a great idea especially when you are buying for two adult tickets! You can either use it straight away or use it later at one of Merlin’s other attractions. Inside the park was a bit of a different experience from the train ride visit too. This time we went on all of the big and scary rides including Saw the Ride, Swarm, Nemesis and, after much persuasion, (me persuading Belle), Derren Brown’s Ghost Train. I’d tell you all about it but I have been sworn (hypnotised?) into secrecy, so you’ll just have to visit and try it for yourself. What fun ideas do you have for reusing empty plastic bottles? 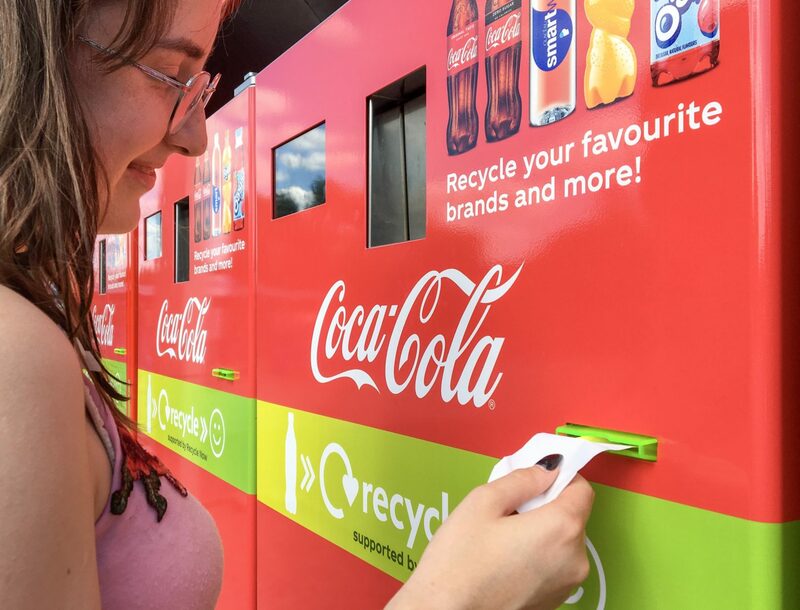 The Coca-Cola Reverse Vending Machine voucher gives 50 per cent off an individual walk-up rate entry ticket to select Merlin Entertainments attractions. Ticket holders must present their voucher at the attraction ticket office to redeem 50 per cent off an entry ticket to their chosen attraction. Voucher valid for one person, at one attraction only. Valid until 19.10.18 at Alton Towers Resort and Thorpe Park Resort, 31.10.18 at Chessington World of Adventures, 01.11.18 at The LEGOLAND Windsor Resort and 31.03.19 at all other included attractions.